CDP-choline stands for cytidine-5-diphosphocholine. This unique form of choline readily passes through the blood-brain barrier (BBB) directly into the brain tissue.103,104 Once past the BBB, CDP-choline activates the synthesis of critical components in cell membranes, enhances cerebral energy metabolism, and increases levels of various neuro transmitters. 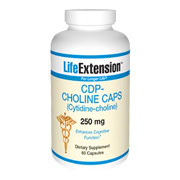 CDP Choline 250 mg is shipped in a discrete, unmarked package. Orders are processed immediately and usually take about 3 to 5 working days to be received.. Any information received is used only for order processing and shipping purposes. Your information, such as e-mail address, will never be disclosed to a third party.